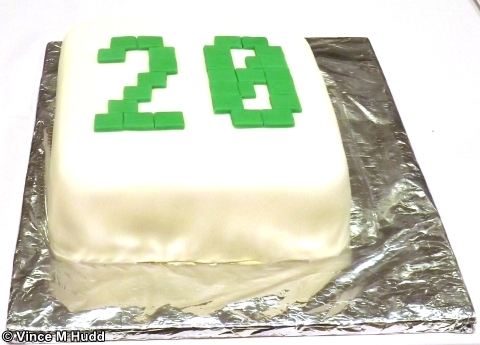 It was a very nice cake, decorated with the number ’20’ to celebrate the number of years since the first Southwest Show – in a tasteful green system font. The choice of colour, of course, was to match the Acorn logo of old, and the system font similarly took us back to Acorn’s earlier computers; even on the earliest RISC OS computers, the desktop used the system font. Oh, you meant more detail about the show itself! As with last year, the stands were laid out in a ‘U’ shape, so this report will follow an anticlockwise path initially, taking in the exhibitors on the inner side of the ‘U’, then a clockwise path around its outside. The show has two organisers, who stepped in several years ago when its previous organiser, Paul Middleton (formerly of RISCOS Ltd) decided to call it a day. 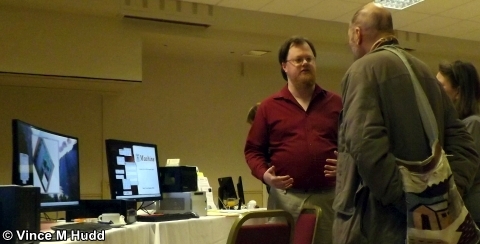 One of those two organisers is Richard Brown of Orpheus Internet – the very first exhibitor you would encounter following my path. The company provides a range of services, from broadband internet connectivity, through domain registration and a variety of hosting packages depending on your needs, as well as networking hardware if needed. 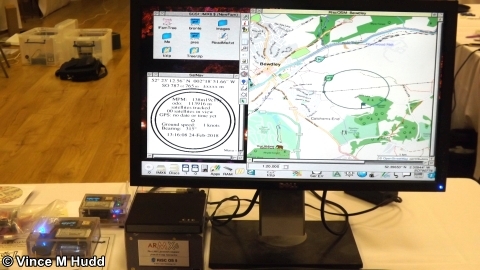 Unlike many ISPs, the company doesn’t expect its customers to use Windows or MacOS and try to wash their hands of any issues for customers who don’t: Having originally been formed in 2005 by the late Paul Vigay – a stalwart RISC OS user – the company continues to be the RISC OS-friendly ISP. 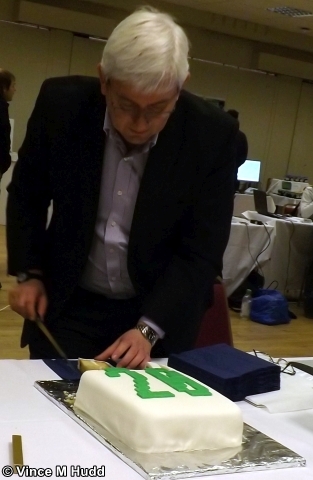 The Orpheus stand was also where the cake was to be found – although that wasn’t cut and eaten until later in the day. Ordinarily, I might at this point suggest I’d talk about that later, therefore, but due to its importance – and not forgetting its tastiness – I may have already mentioned it. Oh, yes, there it is above – thought so! I won’t mention it again. A notable omission from this year’s list of exhibitors was CJE Micro’s, due to Chris Evans being a touch busy with work being done on his new house. However, with the little shop with a lot of stock not venturing up from its South coast base, that left long serving employee Andrew Conroy with an opportunity to attend in his own right, and bring along a selection of his own projects. 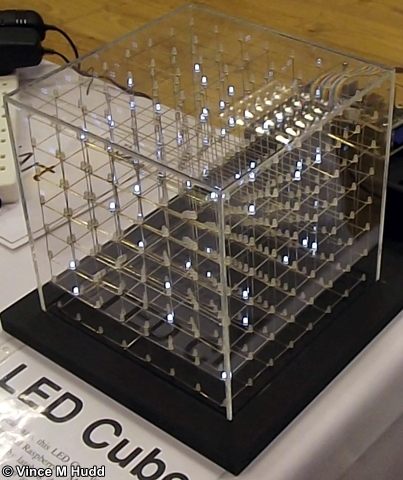 Those projects include a cube made up of LEDs in an 8x8x8 array – 512 of them in total. Powered and controlled from a Raspberry Pi running RISC OS, the cube has been seen before at a RISC OS show and therefore on these pages, but remains fascinating to watch – although it could also be fun to play; I’m sure a simple 3D game could be written that uses it for the playing area rather than the screen. A pair of Blinkt strips (Blinkt Twice – geddit? 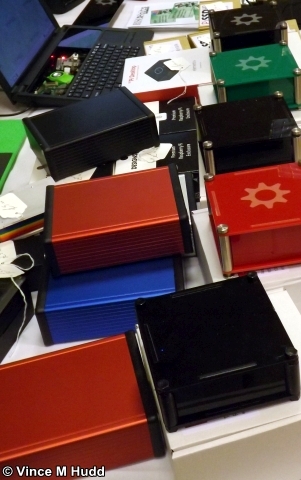 ), each of which features eight bright RGB LEDs. A Four Letter pHAT, which offers a four character, eight-segment LED display. A Scroll pHAT, featuring a matrix of RGB LEDs, fifty five in all set out in five lines of 11. 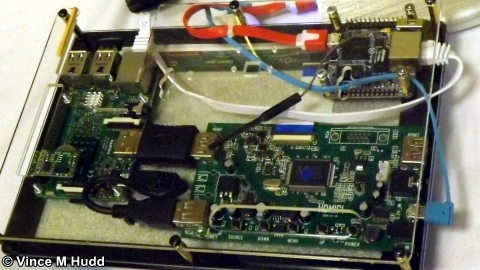 The same Pi was also powering a Simon game (see the next pucture, below) which was originally put together for use with the BeagleBoard, but has since been adapted to work off the Pi’s GPIO headers. With all those flashing lights, it’s easy to imagine that in Andrew’s home it must be like Christmas every day – but when not playing around with such things, and when not working at CJE Micro’s, he also organises the Southampton RISC OS User Group meetings, which take place on the second Tuesday of each month at Itchen College. 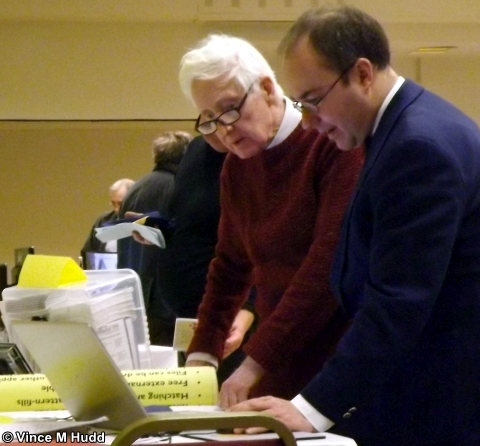 If any visitors to the show had happened to come up from that general direction, therefore, he was able to extol the virtues of coming to the group’s meetings. 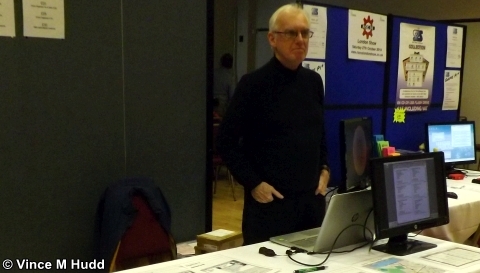 After Andrew’s stand, as we reached the, er, ‘U-bend’, the next exhibitor was Adrian ‘Mr Freeze’ Lees. Adrian is probably most well known these days for Aemulor, a piece of software that acts as a bridge between the 26-bit and 32-bit worlds, by allowing old, 26-bit software to run on newer 32-bit hardware. 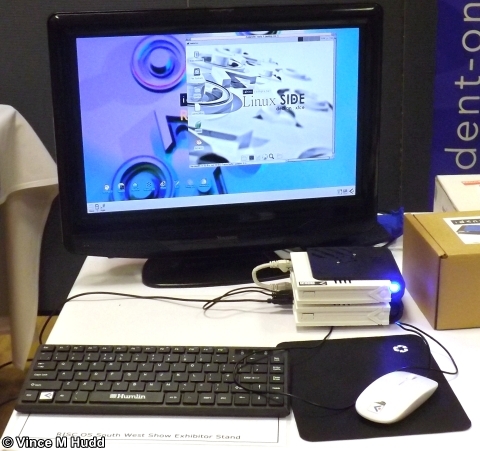 The software was originally written for the IYONIX pc, the first RISC OS computer that required a 32-bit version of the operating system and any software to run on it, and it has since been released for other systems, right up to the latest machines. As an added bonus, although some versions were only available commercially, the software is now free to download. Adrian was also responsible for Geminus, another once-commercial offering for the IYONIX pc that since became free to download, this time providing graphics enhancements such as supporting screen rotation if you had an LCD panel that could be used in portrait mode, multi-head support if you installed additional graphics cards, improved JPEG rendering, and much more. The Southwest Show saw him demonstrating a new version of the software, currently for the ARMX6, providing graphics acceleration facilities. 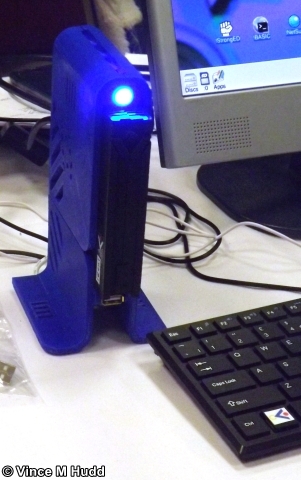 The software uses facilities of the CPU in the computer to accelerate block copies and fills – which can help on the desktop for window redraws, dragging, and so on. To see the effects of Geminus in action, take a look at the video recording of Andrew Rawnsley’s presentation, embedded later in this report. Oh, and if you’re wondering why I’m calling Adrian ‘Mr Freeze’, there was a fire alarm at the Webbington at around 5:00am on the morning of the show, so all the exhibitors (and other guests) staying in the hotel spent some time in the early hours on that very cold morning in the courtyard. Adrian subsequently commented on The Icon Bar that “Icy cold is good for me – long story” and since he didn’t expand on that, I’m assuming it involves being accidentally covered in an experimental freezing chemical. The man who could previously help you find out where you are, Chris Hall, was now able to help you find out who you are and where you come from. Well, he could help you keep track of that information, at least, in a nice, easy to understand way. 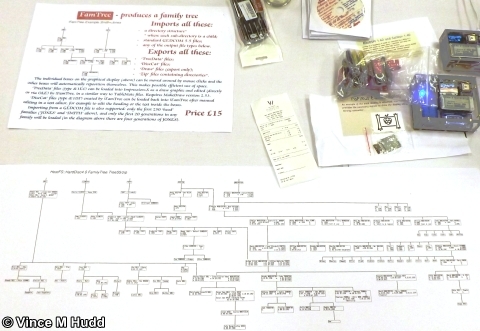 Having previously put together a portable GPS-based system, centred around a Raspberry Pi – primarily for use on the Severn Valley Railway – Chris was showing off a new piece of software for building family trees from data stored in a directory tree, called FamTree, which is now available to buy from !Store. The software’s inspiration comes from Chris’ decision to write his autobiography, for which he researched his own family tree. Realising that he already had an application that can produce a tree-like image based on the contents of a directory tree in the form of Cat, developed a few years ago, he realised that the same basic structure could form the basis of a family tree, with each directory representing a specific person, and subdirectories representing offspring. 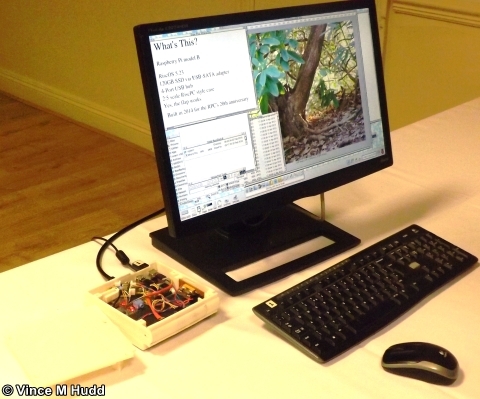 Chris gave one of the presentations at the show, in which he demonstrated FamTree, before going on to talk about his GPS systems and SatNav, the software he wrote for it. One of the nice features of SatNav is its ability to relay information to mapping applications such as RiscOSM – so it was an astounding coincidence that Sine Nomine’s Matthew Phillips was to be found on the next stand, showing off that very software, amongst other things. 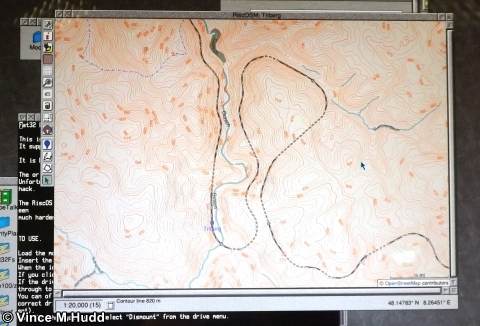 were looking into the possibility of adding contour lines to RiscOSM, because Ordnance Survey had made the necessary data available under a suitable licence. This is now a reality, though I gather it is not quite ready for release yet. In fact, this was not only ready for release, but a feature of the version being sold. The contour data at that point only covered Great Britain because that’s what the Ordnance Survey data covers, but NASA also provides contour data, which comes from its Shuttle Radar Topography Mission, and it was a version including that data that still had a little work to be done on it before it could be released. In my report I mixed up the two – so apologies to Matthew and Hilary. By the time of the Southwest Show that work had been done, and the main feature of the Southwest Show release of RiscOSM was support for contour data for most of Western Europe. Matthew was also selling other products from Sine Nomine’s range, such as their various puzzle games, and the relational database Impact. The On-off-on-off-under-new-management PDF magazine with its crazy paving page numbering, Drag ‘n Drop, was represented on the next stand by Christopher Dewhurst, who took over the magazine from its original editor Paul Stewart back in 2012. 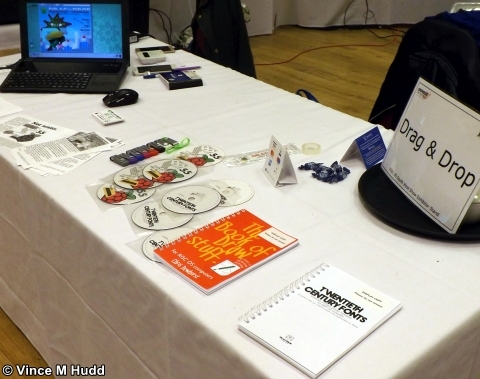 Chris had his usual range of products available to buy including the magazine itself on a USB stick along with every previous issue to date, The Book of Draw Stuff, and the Twentieth Century Fonts book and CD combo. After Chris, the end of the ‘u’ layout of the room was where the charity stand could be found. As ever, this stand was incredibly well-stocked with all sorts of goodies donated by people who would prefer to see the hardware, software, books and magazines that they no longer need go to a good cause rather than landfill. This year, £110 was raised at the show, and the money went to Secret World Wildlife Rescue, a local animal charity based near Highbridge that aims to rescue sick, injured or orphaned wildlife. 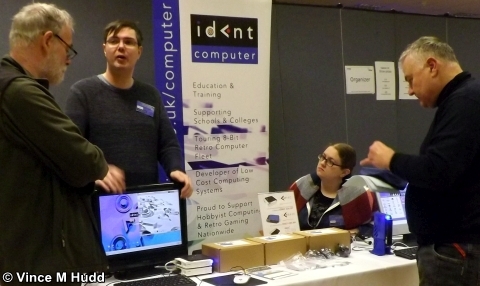 With the charity stand at the end of the ‘U’ shape, the first stand on the return trip around the outside of the shape belonged to AMCOG Games, where Tony Bartram had his range of software available to buy – a range that includes an impressive number of games considering the relatively short amount of time that has passed since Tony first tried out RISC OS. 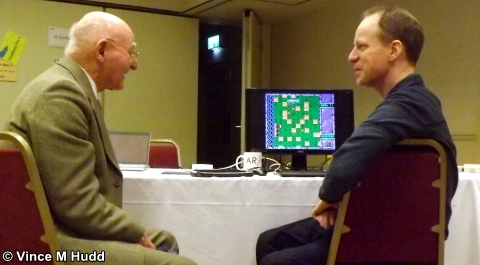 Tony’s first game for RISC OS was Overlord, released at Wakefield 2015, less than three years before this event, and in that time Tony has released a further six games, along with a games development kit, and another game still in development at the time of Southwest 2018 and since released, and he was happy to discuss his progress on the game if you asked nicely. 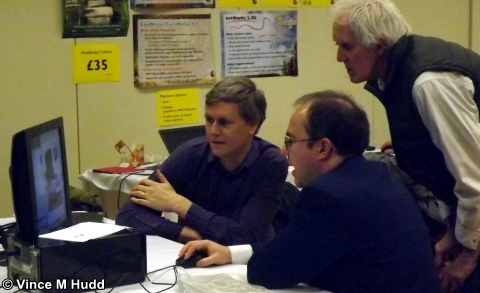 Tony is also an amateur musician, which not only brings a benefit to the games – all of them feature original music tracks – but this has also led to him taking a long hard look at the RISC OS sound system, resulting in RDSP, a software synthesiser that brings the that system to life and makes it much easier to use. Moving on from having fun with games, the next stand belonged to RISCOSbits, run by Andy Marks who has been known to have fun with names – the names in question, of course, being those of the products he sells. 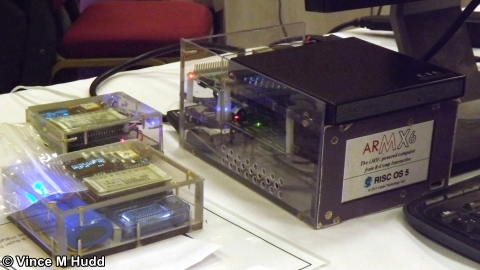 A shining – and child-friendly – example of that is BÜRP, an extruded aluminium enclosure that can hold almost any of the various modern boards that can be used to run RISC OS, as well as a number of other modern boards that, er, can’t. Some product names are less child-friendly, depending on how they are pronounced, such as the multi-puntastic Pi-Llok Ace (think about it, then think about it again), and one where the name could lead you down an unavoidable “Why do you think that name’s funny, Dad?” road – the PiSSDup. However, one of the less problematic names is the dead simple Skins – which take a number of forms, such as the PiNuts. 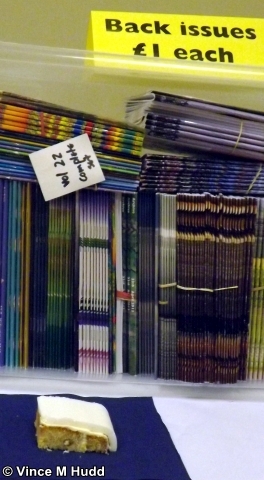 These are cut-fold-stick cases, which are sold in batches of five for £5.00, and it is only while writing this show report that I realised a trick has been missed. Andy should have been selling them in batches of four – so you would hand over your money, and in return you’d get fore four skins. Stop sniggering! It wasn’t that funny, and my terrible pun didn’t even mention that the skins need to be snipped! My taste in jokes may now be in question (if it wasn’t already), but my taste in jam is another matter – and some very nice jams could be found on the next table, belonging to Mary Norris and her Tasty Treats. The treats didn’t stop at jams – there were also marmalades and chutneys. However, I can’t comment on those because my tastes don’t extend to them. 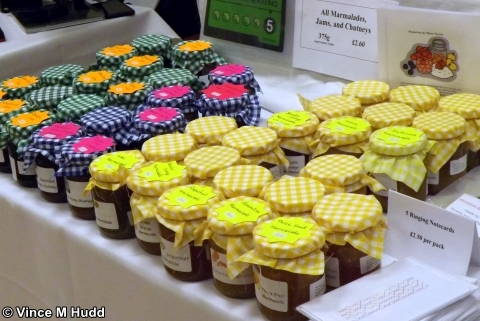 Interestingly, despite the fact that Mary has been selling her jams (etc) at the Southwest Show for a number of years – and that I’ve been buying some jams (not etc) from her for a number of years – I’ve only now noticed the colour-coding; the yellow-topped jars are marmalades, the blue-topped ones are chutneys, and the green-tops are jams. Next to Mary was husband John with his campanology set up – a variety of material related to the topic of bell-ringing, including a wooden tower that plays host to a papier maché bell; the show’s customary centre-piece that’s never in the centre. 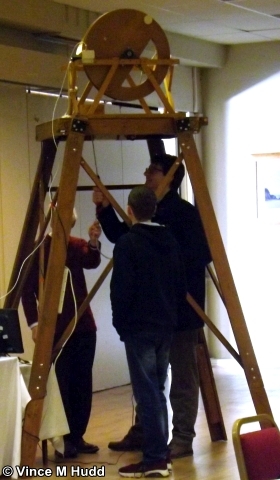 The purpose of the tower and faux-bell is to serve as a bell-ringing simulator, allowing people with an interest in campanology to practice their art without making lots of noise and disturbing the neighbours. Being papier maché the bell makes no real sound, and instead a sensor attached to the frame detects the bell’s movement. That information is fed to a RISC OS computer running John’s ‘Stringing’ software, which plays the sounds as if a real bell had been rung, and which the practising campanologist is able to hear at a volume level that doesn’t result in any noise complaints. As well as a keen campanologist, John also describes himself as an amateur historian, and in that capacity has written, amongst other things, a booklet titled The Church Bells of Hurstspierpoint – the village in West Sussex in which John and Mary live – covering the history of those bells. A printed version of the booklet was available on the day for £1, and it is also available to download from his website – along with another about the church itself, and a few other fascinating items. 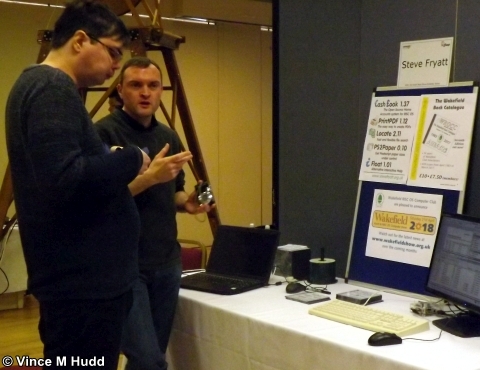 Exhibiting on behalf of both himself and his local user group, Steve Fryatt had the next stand. 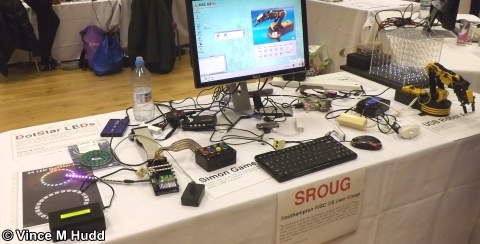 Steve’s local user group is a fairly notable one: the Wakefield RISC OS Computer Club (WROCC), a group based in the Northwest of England and known for organising one of the main events of the year – the Wakefield Show. There was a poster on Steve’s stand advertising the 2018 show, which took place in April (report coming, er… soon… ish! 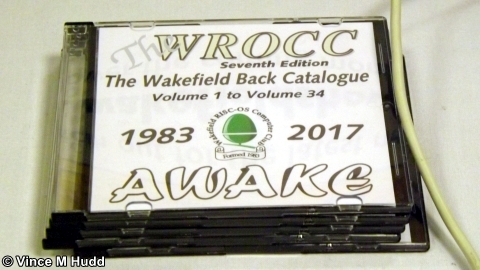 ), and he was selling copies of the seventh edition CD of the WROCC back catalogue, containing every issue of the club’s magazine going all the way back to 1983, as well as taking new sign-ups to the club itself. 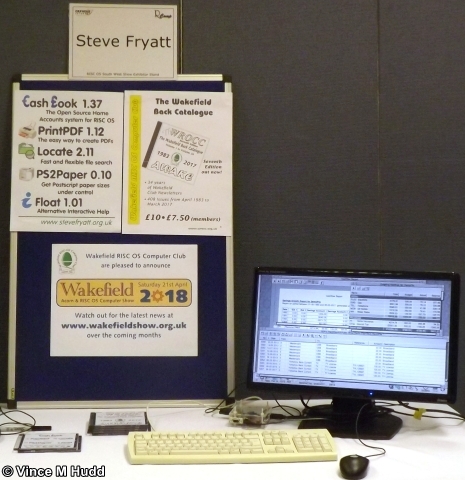 Steve was also talking about his own range of software, including CashBook, Locate, PrintPDF, and more – all of which is available to download from his website for free, or can be purchased on CD at shows with the proceeds going to the Wakefield Hospice, the charity supported by WROCC. 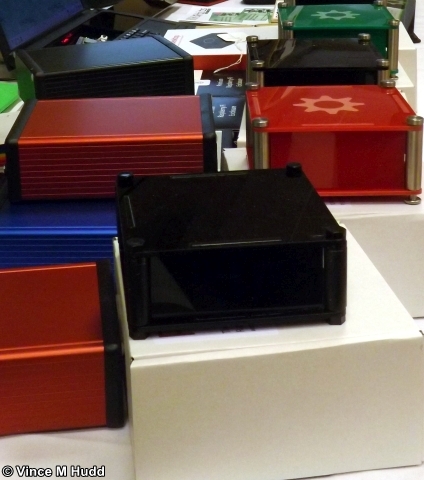 With a range of snazzy new 3D-printed cases, the next stand was occupied by Ident Computer. 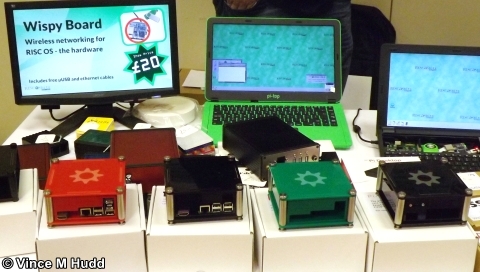 Tom Williamson and his partner Anna first started exhibiting at shows only a couple of years ago with the Micro One system, a design that had something of a retro feel to it by housing the Raspberry Pi in a case with the keyboard. 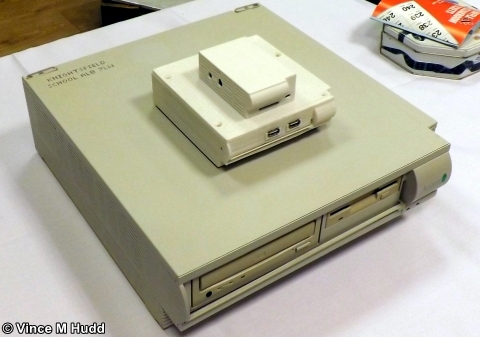 Supplied in kit form, the system had an interesting history to it, having started life as a purely in-house attempt at producing a simple case using an A4 box file – and as a result of being asked if they were available to buy, the design received a little more thought and effort, leading to the plastic version that was put on sale. Since then, the company has invested in some high-end 3D printers, initially to produce kit for model railway enthusiasts, a field in which the duo have a keen interest. 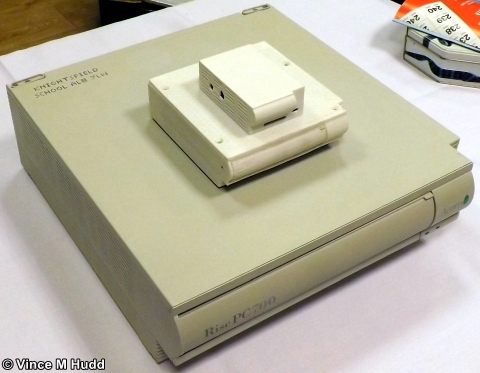 With that equipment in place, though, it was an ideal opportunity to produce a replacement for the Micro One – and so the Compact Edition, or CE, came to be. The CE isn’t just a single case design, but a range, with a version with RISC OS users in mind, another for Linux users, and a third still for the gaming community. The case can be placed flat on your desk or, with an optional stand, in a vertical configuration. Almost bright enough to double up as a desk lamp (um, okay – that might be a slight exaggeration on my part), Anna told me that the reason for the very bright light on the case was simply down to a mistake by Tom when ordering that particular component. Oops. However, it’s possible to put the case together and not use the light at all, and you could also put something over it, which would therefore give you the best of both worlds – expose it when you want the light, cover it when you don’t. The Southwest Show being one of the main events in the RISC OS Calendar, it’s probably a good idea to know when it is – or was – which is where Organizer can be handy. North One Communications, purveyors of said application, were therefore present to persuade you to purchase it. Version 2.28 of the software, released at the 2017 London Show, was the version available at this show. This version features enhanced layouts for the Anniversary, Diary, and Planner windows, taking advantage of the extra space available to those lucky people with extra-wide displays by employing a multi-column, scalable layout. Cut-me-own-throat Dibbler Nigel Willmott had the on-a-stick flavour of Organizer for visitors to purchase: a 4GB USB flash drive with the latest version of the software, and RPCEmu 8.15 all set up and ready for use. The next stand was mine, where I was representing Soft Rock Software, demonstrating and talking about my various software products, from the old budget games all the way up to the most recent version of WebChange (and its lack of a manual) – and I was even willing to sell that software to people on either CD or USB flash drive in the form of The Soft Rock Software Collection. New at the Southwest Show, produced as a bit of an experiment for the Recursion Computer Science Fair a week earlier, I also had micro-SD cards with the RISC OS disc image for the Raspberry Pi, with the budget games pre-installed: Game Pi. 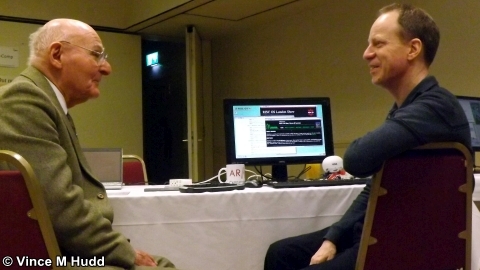 Unfortunately, the experiment was a failure: At previous Recursion events, I was frequently asked about the availability of the games, and the explanation I gave in reply always started with “first, you need to set up a bootable card with RISC OS installed…”, at which point eyes would glaze over. Subsequent discussions led me to conclude that if I was to provide a bootable card with the games installed, it would be bought – so in the run up to Recursion I arranged just that. Unfortunately, though – possibly due to the timing change for the show, which was previously held in July. The event was much quieter this year, the interest just wasn’t there, so none were sold at the event for which they were produced. Also on my stand was an extra computer and screen, running a rolling demo of a selection of the old Jan Vibe graphics, originally seen in the pages of Acorn User magazine for readers to type in. 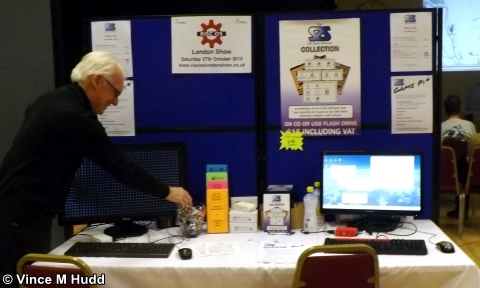 Jan’s programs had been updated to run on the Rasberry Pi by Richard Ashbery, who also put the rolling demo together for me to use at the show. 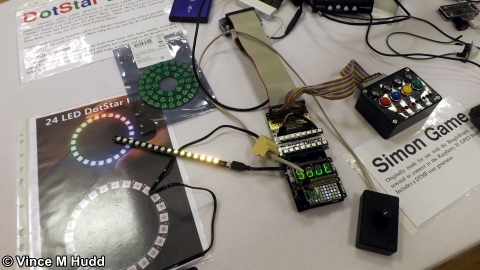 From time to time I also had a version of a very simple graphics demo written on a BBC Micro by Eben Upton (of Raspberry Pi Foundation fame) at an event held at the Centre for Computing History. Eben’s version was short enough to be posted in a single comment on Twitter, but I modified it for the Pi so that it not only made use of the much better graphics capabilities, but also cycled through several different versions based on the original, so it was quite a bit longer. 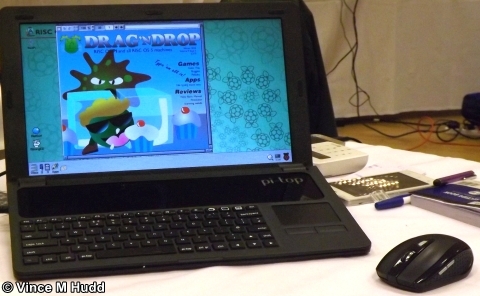 Coming originally from the Computer Concepts stable, Impression was never updated to run on anything more modern than Acorn’s 26-bit RISC OS systems, such as the RiscPC – and worse, it was largely written in ARM assembler, which is what makes the task of updating it such a big one. And the problems don’t end with the language it was written in – the sources that Richard has are also incomplete; there are some components missing, which he will have to recreate from scratch. In spite of all of that, although it still contains a very large amount of 26-bit code, and therefore still requires the use of Aemulor to run, Richard does seem to be making very good progress with it. Making a welcome return to the Southwest show this year was Martin Würthner of MW Software. Martin was unable to attend the 2017 show – and, in fact, has been missing from many shows of late due to family commitments. 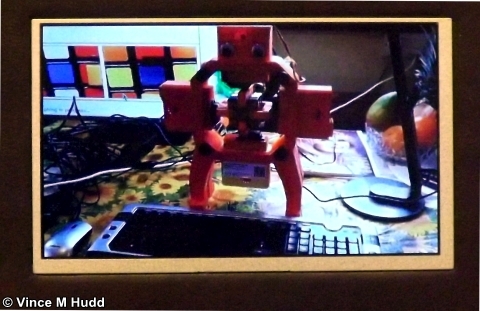 His first appearance since Wakefield 2016 was London 2017, at which version 2.x3 of ArtWorks was released, which brought full compatibility with the way colours are handled on hardware such as the Titanium and IGEPv5 boards, with the red-green-blue elements reversed. As well as this important fix, the software also gained a new creative tool that allows a vector shape to be used as a brush to draw new shapes, and to erase parts of other shapes. The Lesser-spotted Archive magazine could be seen on the next stand, with editor Jim Nagel available to discuss the magazine and take subscription payments. There wasn’t a new issue available for the show, because Jim had decided to hold back to try and squeeze in any show news. This presents a difficult balance, with most exhibitors making their announcements in the week or so running up to the show (some in the very last few days), while in order to produce an issue to be available at the show, the magazine needs to be with the printers in plenty of time for its content to be transferred onto dead trees. A new copy of the magazine was prepared in time for the Wakefield Show and, as ever, it proved to be a good read. Okay, you can carry on reading again now. 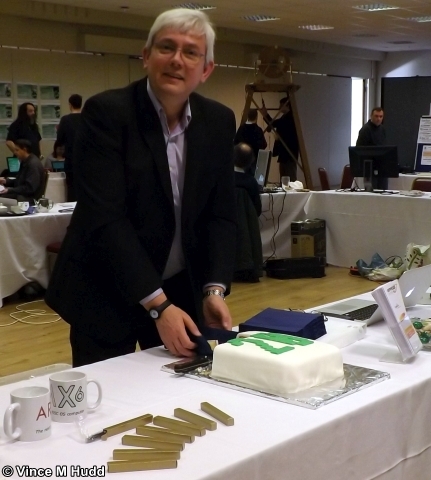 This trip around the Southwest Show began with one half of the team that now organises the show – and so it almost ends the same way, with Andrew Rawnsley and the R-Comp team on the penultimate stand, with the usual wide selection of software and hardware. 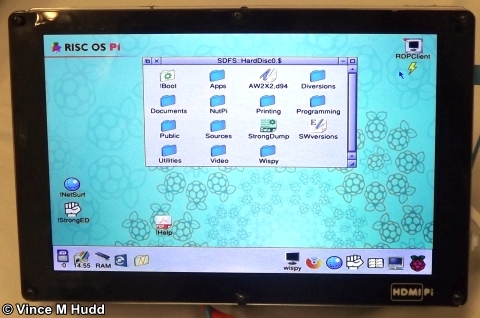 The hardware includes peripheral devices such as monitors (including a very nice, curved extra-wide screen one that works brilliantly with ARMSX ARMX6) as well as the R-Comp range of computers, with a mixture of native ARM-based systems, and more standard PC hardware running RISC OS under emulation. There was no new hardware from the company for this show, but a few days earlier some OS and software updates were announced for the ARMX6 and TiMachine range, and which the team were demonstrating to customers on the day. 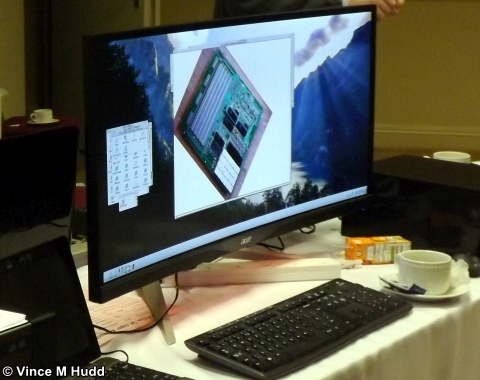 For the TiMachine, this included a new version of the multi-head driver (which allows two monitors to be used with the computer – or a single monitor with two suitable inputs and split-screen capability to be used as a single, ultra-wide display beyond the capabilities of the individual outputs on the Titanium board). On the software front, R-Comp also had a new version of NetFetch. Version 5.03 of the software features improved SMTP handling, allowing users to send email through different SMTP servers, depending on which email address they are using, to ensure the route the email takes to reach its destination begins with it being injected at a point authorised to handle email from it. A new version of Quake Resurrection was also released a few days before the show, updated to work on newer platforms, featuring a wealth of levels to play, including the Malice ‘total conversion’ – a different game with a different story, running on the Quake engine. The final stand of the day was – just about – one of the closest stands to London, which is an astounding coincidence because it just happened to be the RISC OS User Group of London‘s stand, where Bryan Hogan was able to discuss the group, its meetings and guest speakers, and more besides. 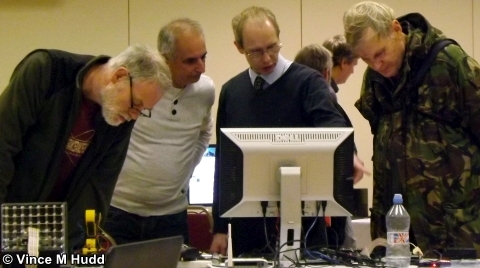 The group meets regularly on the third Monday of each month in a central London venue, and most meetings feature a guest speaker, sometimes from the world of RISC OS, sometimes just on the edge of that world, and sometimes from beyond it but with some connection or relevance. All in all, the group seems to be a good one to be a member of, and their meetings great ones to attend if you are in or around London, or don’t mind venturing into the nation’s capital on a week night. 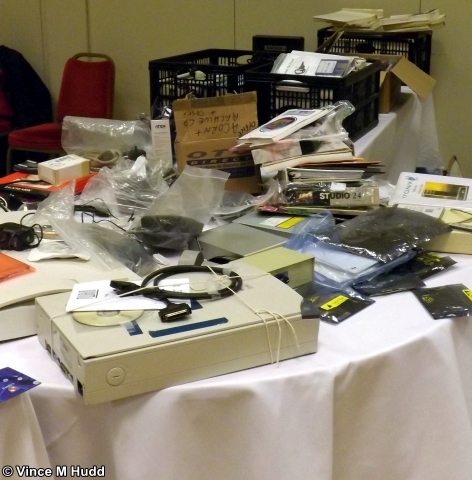 So that, folks, was the RISC OS Southwest Show, 2018. 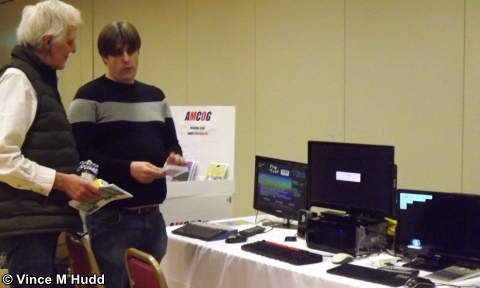 Readers and those who visited the show alike will have noticed two missing exhibitors – two companies that usually appear at all the main UK shows: CJE Micro’s (who I’ve already mentioned) and RISC OS Open Ltd. Neither were able to attend for their own reasons, unfortunately, but that also means both missed a very enjoyable show. The event was quieter than previous years – visitor numbers were down, and it’s possible that the two missing names may have been a factor in that – but despite this, the exhibitors were mostly very positive, reporting an upbeat event with better sales than they normally expect at the show, which is a very nice point to be able to make (not least because that includes my own show sales). The date for the 2019 show is already set as 16th February, 2019 – but with a change of location. After twenty one shows, with a twenty year span between the first one and the last, the Southwest Show is finally saying farewell to the Webbington Hotel. It’s a very nice venue, set in a beautiful location, and for those who stay overnight it offers very nice rooms and great food – but at the same time, for anyone travelling to it by any other method than car, it’s a pain to get to. After a little bit of research, a new venue has been found in a location that should be much easier for everyone to reach, no matter their mode of transport – the Arnos Manor Hotel in Bristol, which is on the A4 Bath Road, a short trip by car from the M32 (which itself connects to the M4, and the M4 to the M5); perfect for anyone coming by car. There are also bus stops very close by, with regular buses running from the direction of Temple Meads railway station – so equally perfect for anyone coming to the show by train. So all that remains to be seen is: See you there!